Round silver medal in a brown celluloid presentation case. 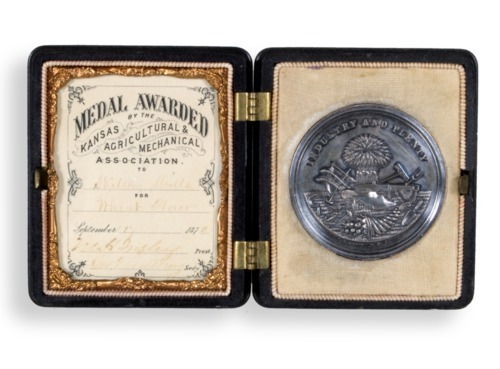 The medal was awarded to David T. Skelton of Leavenworth by the Kansas Agricultural & Mechanical Association of Leavenworth. It was given for the wheat flour produced by Skelton Mills, also of Leavenworth, on September 17, 1870. The presentation was made by M.H. Insley, President of the Association, and George T. Anthony, the Secretary (and later Governor of Kansas).